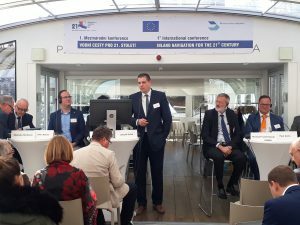 Director of AdMaS Research Center, dr. Zdeněk Dufek, attended the international conference Inland Navigation for the 21st Century, which took place in Prague on 1 April 2019. In his contribution he informed about the progress of the project of our research center focused on the design of technical regulations for the safe construction and operation of LNG refueling stations. This alternative fuel is becoming a reality even in the Czech Republic. Last year, the Ministry of Transport announced a subsidy call to support the construction of LNG refueling stations, which were used by several entities. By 2022, more than a dozen LNG refueling stations can be expected to be put into operation. Among other things, it offers the possibility of placing LNG stations in ports close to major road routes. To do this, it will be needed to create safety regulations so that the stations can be designed, commissioned and operated safely. On March 11, 2019, the Povodí Morava held its regular meeting at the Admas Center. Before the start, the Technical and Operational Director, Ing. David Fína, and CEO, MVDr. Václav Gargulák, met the director of the AdMaS Center, JUDr Ing. Zdeněk Dufek, Ph.D., and discussed the areas of possible cooperation. This was followed by a presentation of the center, the meeting itself and an afternoon tour of the individual laboratories. 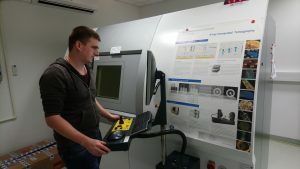 On March 11-22, 2019, a Russian student from Kalashnikov State Technical University, Aleksandr Gumenyuk (Александр Гуменюк), was trained at the AdMaS Center. As part of this internship, he worked on his master’s thesis devoted to extending durability and optimizing the mechanical properties of sulfur-containing cement composites. 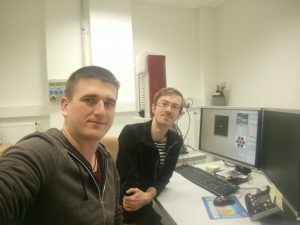 During his internship he used mainly computer tomography and scanning electron microscopy to study the microstructure of the materials being developed. On Friday, March 15, 2019 the management of the AdMaS Center convened a regular employees meeting. In the FAST lecture room, the director, dr. Zdeněk Dufek, presented the results of the AdMaS project for 2018, the Dean, prof. Miroslav Bajer, familiarized the participants with preliminary plans in the coming years, when the center sustainability ends and finally prof. Novak acquainted the colleagues with the rules of the AdMaS UP project for 2019. Employees were also informed about the project of the National Competence Center CAMEB and others project that the center will apply for in the future. 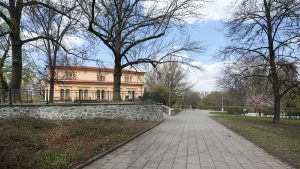 The Brno City Hall will be assisted with cases of more serious violation of the static state of buildings this year by an expert team from the Brno University of Technology. For example, it will focus on the Lužánky Leisure Center. This week, the councilor approved the free cooperation agreement between the city and the university. The city owns a number of objects that have been damaged by statics. An example is the Lužánky Leisure Center. Here, this year’s dry summer and the overall change in climatic conditions have affected the geological conditions to such an extent that the side wing of the building has found itself practically in disrepair. What measures to take to make such objects safe again are suggested by expert team from the Faculty of Civil Engineering – AdMaS Center. The AdMaS experts even want to provide the city with the necessary expertise for free. “The Faculty of Civil Engineering will include the evaluated objects in the practical training of specialized subjects in higher grades, including the offer of topics for the final theses of the students,” said Assoc. Prof. Pavel Schmid for VUT. The output of the cooperation will be, along with the necessary effective proposals for appropriate building measures, common professional publications or contributions at professional conferences. “One of the goals of AdMaSu is to create a methodology for exploring damaged buildings. This will become an important tool not only for the staff of the property management department, but also for the housing and investment departments when commissioning construction and technical surveys. It is often very difficult to determine in advance what the survey provider is supposed to do, that is to say that the assignment contains only the necessary information and does not neglect any important action, ”said Oliver Pospíšil, Deputy Mayor of Housing and Property Management. The representatives of the AdMaS Center participated on 26 February 2019 in the event organized by the Ministry of Industry and Trade in Prague called BIM Concept 2022. The aim of this event was to familiarize key stakeholders in the process of introducing BIM technology in the Czech Republic with their activities and to allow for discussion. Representatives of the state administration, major public contracting authorities, designers, contractors, engineering chambers and universities presented their progress. AdMaS Center activities were presented at the event by the Center’s Director, Dr. Zdeněk Dufek. Among other things, he provided information on the BIM lifelong learning course, the completed public monograph on Public Construction, on the development of BIM models as a basis for evacuation models of people and models of smoky spaces and on a project that the Center will address within the National Competence Center CAMEB relating to linking virtual reality and BIM. 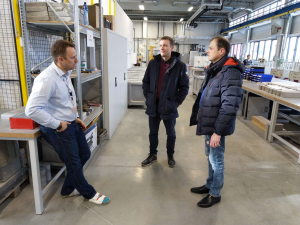 On 21 and 22 February 2019, two Lithuanian colleagues from Kaunas Technical University visited the Faculty of Civil Engineering and the AdMaS Center. Both guests took a round of the center accompanied by doc. Karel Dvorak, prof. Rudolf Hela and doc. Lenka Bodnarova, then visited the accredited testing room with Ing. Adam Hubacek. 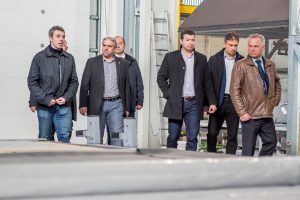 The Director of the Building Materials and Construction Research Center, Ernestas Ivanauskas, along with Project Manager Audrius Grinys, showed an interest in close cooperation in the field of concrete and concrete testing, as well as in the field of building materials microstructure analysis. Both visitors appreciated the high level of expertise of the researchers and the hardware and technical equipment of the TBM and MBM research groups. On 18 – 19 February 2019, the EGAR RG, together with colleagues from Mendel University of Agriculture and Forestry in Brno and ZERA Agency (Agricultural and Environmental Regional Agency, zs.) participated in an excursion to the WWTP Linz – Unkel near Bonn, Germany. At this wastewater treatment plant, a unique PYREG facility is operated, which provides pyrolysis treatment of sewage sludge. The project, funded by the German government and taking into account the amended German Sewage Sludge Decree, is interesting from two perspectives. It uses phosphorus, resp. the PYREG plant drains the sewage sludge, carbonizes it, disinfects it and can be used as a soil conditioner or fertilizer with high bioavailable phosphorus content. Furthermore, it is a device that is autothermal – pure energy from the treated sewage sludge is used for plant operation. The EGAR research group, together with its partners, is engaged in microwave torrefaction of sewage sludge, which is one of the forms of low temperature pyrolysis. In the AdMaS center, within the scope of the research, dried sewage sludges from various large WWTPs on laboratory equipment are tested, as well as in a small pilot plant with a capacity of about 10 kg of dry sewage sludge per experiment. 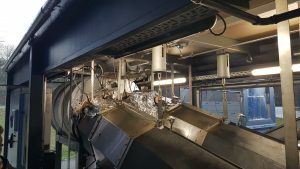 The RG EGAR also shares similar goals with the German colleagues – to transform the sewage sludge with the technology into a carbonaceous product with a wide application – in agriculture, energy, or as a filter medium. The aim of the excursion was to exchange contacts and experience from the operational application of technology, the possibility of comparing legislation, when the Czech Republic is currently deciding how to deal with future treatment of sewage sludge, and the so-called German route is one of the options. At the same time, RG EGAR received samples of carbonaceous product, which can be further compared with its own development. The aim is to identify and quantify the marketing potential of the new port territory of the Czech Republic in Hamburg for trade between islands (and Europe using offshore maritime transport) and the Czech Republic, identification of opportunities for the port State’s function to support trade with the Czech Republic and identification of technical parameters for the port territory. The new harbor area will reach the basic parameters of the area of ​​30 thousand m2, includeing handling and storage area, covered warehouse, administrative facilities, harbor walls 200-300 m long with a boat access to the boat about 11 m without limit of height, accesses of river boats without restriction, road and rail connection. The port territory is under the jurisdiction of the Federal Republic of Germany, the Free and HanseaticCity of Hamburg, in the port territory without a defined customs territory or other access restriction, whereby the landlord of infrastructure to individual users will be the Czech Republic through the Directorate of Waterways of the Czech Republic. The port territory will be activated in the reference year 2022. At the beginning of January, we welcomed another Brazilian trainee, Giulii Tomazi Kny at AdMaS, Center. Giulia comes from the city of Porto Alegre and is a bachelor’s student at the Federal University of Rio Grande to SUL (UFRGS http://www.ufrgs.br/english/home). She joined the Admas Center as part of a program of academic internships for Brazilian students at research institutes at Czech universities, organized by the Institute of Czech-Brazilian Academic Cooperation INCBAC (http://www.incbac.org/index_en.php). 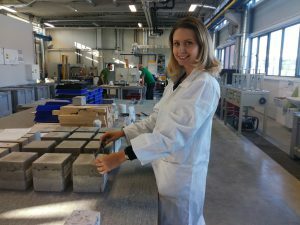 Giulia was involved in the project Optimizing Granulometry of Fine Parts in Concrete, led by prof. Hela, a member of the TSH research group.